Sikh Temple Shooting Suspect's Ties To White Supremacists Being Probed : The Two-Way Law enforcement officials confirm that the man they say was the gunman was Wade Michael Page, 40. Authorities are treating the attack as a possible act of domestic terrorism. They're looking at ties between Page white supremacist groups. 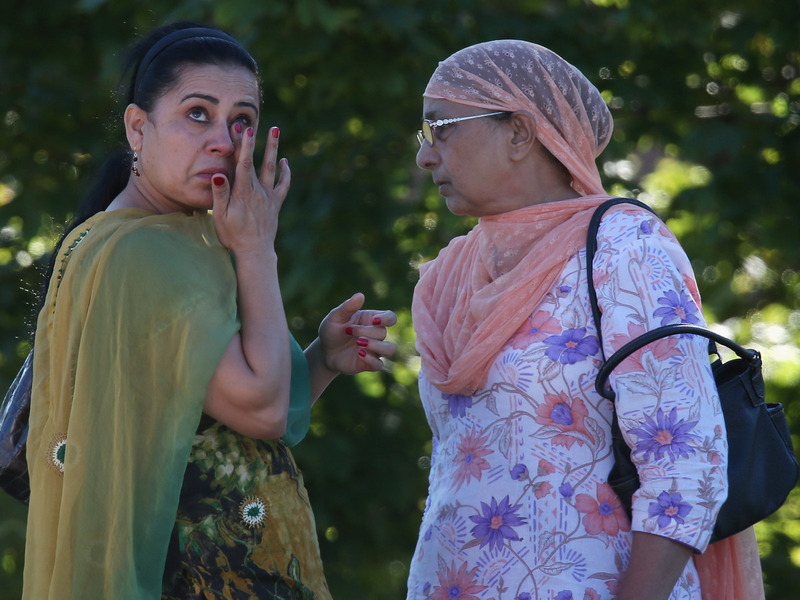 A woman wipes away a tear in front of the Sikh Temple of Wisconsin on Sunday in Oak Creek. President Obama gave televised statements about the shooting which he called "terrible, tragic." "All of us recognize that these kinds of terrible, tragic events are happening with too much regularity for us not do to some soul searching," the president said, according to Politico. Obama said that "the American people immediately recoil from" any kind of violent action driven by hate. "In this country, regardless of what we look like, where we come from, who we worship, we are all one people," he added. "And we look after one another, we respect one another." As we reported earlier, authorities say they believe the gunman acted alone. But they also want to talk with a man who appeared at the scene Sunday after the shootings. Milwaukee's Journal Sentinel has posted a short video clip showing that man. It adds that if anyone recognizes him, "tips can be called in at 1-800-225-5324." "Nobody knew this guy was a threat ... that's the problem with these types of cases," said FBI Special Agent in Charge Teresa Carlson to reporters moments ago. Authorities need help in identifying individuals who might be threats before such tragedies happen, she added. "We are looking at ties to white supremacist groups," FBI Special Agent in Charge Teresa Carlson just said of the suspected gunman, Wade Michael Page. Asked about the "person of interest" who authorities want to speak with, Oak Creek Police Chief John Edwards just said that "he's an individual who showed up at the scene after the shooting." Some officers at the scene though "this guy looks suspicious" but he left the area before authorities could speak with him. Also at the news briefing, officials just said that the gun used by the shooter was purchased legally. Authorities "don't have any reason to believe there was anyone else associated with this shooting," FBI Special Agent in Charge Teresa Carlson just said at the news briefing now underway in Wisconsin. But she said authorities are going to release a photo of a man who is a "person of interest." Carlson did not go on to say why authorities wish to speak with him. Authorities just said that five of the six people killed by the gunman were men, ranging in age from 39 to 84. A 41-year-old woman was also killed. -- Seeta Singh, 41, male. -- Ranjit Singh, 49, male. -- Satwant Singh Kaleka, 62, male. -- Parkash Singh , 39, male. -- Parmjit Kaur, 41, female. -- Subegh Singh, 84, male. The man killed at the scene who police say was the gunman has been identified as 40-year-old Wade Michael Page, Oak Creek Police Chief John Edwards just told reporters. That's the name sources gave to NPR and other news outlets earlier today. Oak Creek Police Chief John Edwards, at a news briefing that's now underway, said that the first officer on the scene, Lt. Brian Murphy, was shot "eight to nine times" after being ambushed by the gunman. He is in critical condition. Other officers arrived at the scene and ordered the suspect to drop his weapon. Instead, the gunman shot at police. It was then that he was shot and killed by one of the officers, Edwards said. Murphy, according to Edwards, tried to "wave off" the other officers as they came to assist him. He "told them to go into the temple to assist those in there," said the chief. The officers got him away from the area, though, and then moved to secure the temple and begin a search to make sure there wasn't another gunman. There's now a "bulletin" from the Southern Poverty Law Center about Wade Michael Page (the name of the suspected gunman, sources tell NPR and other news oulets) and his "racist white-power band." Wade Michael Page, the name of the gunman according to sources who have spoken to NPR and other news outlets, "was a frustrated neo-Nazi who had been the leader of a racist white-power band known as End Apathy," Heidi Branch of the Southern Poverty Law Center tells Milwaukee's Journal Sentinel. The newspaper writes that Branch also said that the center, which keeps tabs on hate groups, "had been tracking Page since 2000, when he tried to purchase goods from the National Alliance, a well known hate group." A MySpace page for End Apathy lists "Wade - Vocals/Guitars." The songs posted there have had relatively few plays. The band describes its music as "a sad commentary on our sick society and the problems that prevent true progress." The current "featured song" is called Self Destruct. There's an April 2010 interview with "Wade" on the website of Label56 (the link may not always work; we've gotten "internal service error" messages a few times). In it, he says the band's songs are about "how the value of human life has been degraded by being submissive to tyranny and hypocrisy that we are subjugated to." He also talks about having attended "Hammerfest 2000," a two-day white-power concert in Bremen, Ga.
-- Born on Nov. 11, 1971. That means he was 40 years old. -- Served in the U.S. Army from April 1992 to October 1998. -- Rose in rank to sergeant, but was reduced to the rank of specialist at some point before receiving a general discharge. Tom adds that a general discharge, unlike an honorable discharge, means the individual had been "performing satisfactorily but did not meet all the expectations of service." And reductions in rank, Tom says, usually related to conduct rather than performance. The gunman was named Wade Michael Page, a law enforcement official familiar with the investigation tells NPR's Dina Temple-Raston. That's the same name that CNN reported earlier, citing "multiple law enforcement officials." Dina's source also says Page was 40 and had served in the U.S. military. Authorities were searching the apartment of the man suspected of gunning down six congregants and wounding three others at a Sikh temple in a Milwaukee suburb over the weekend, but were releasing few details of the alleged assailant. The suspect was described by federal officials as a white man in his 40s, according to The Associated Press. Authorities say he was killed in a shootout with police during Sunday's attack at the temple in Oak Creek, Wis. Officials have so far declined to name him or speculate on a motive other than to say they were treating the crime as a possible act of domestic terrorism. The AP said federal agents and the county sheriff's bomb squad had swarmed a neighborhood in the Cudahy suburb of Milwaukee where the suspect lived in an apartment. The news agency quoted Bureau of Alcohol, Tobacco, Firearms and Explosives Agent Tom Ahern as saying warrants were being served at the home. The Milwaukee Journal Sentinel quoted landlord Kurt Weins as saying the man was an Army veteran. Weins told the newspaper that the man had "checked out" before renting the duplex and that he believed his tenant was from Chicago and had no record of violence in Wisconsin. 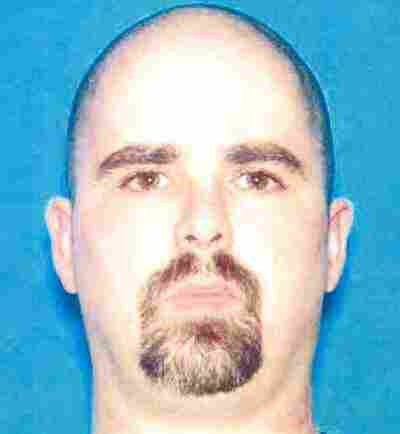 Weins said the man was something of a loner and that there was nothing suspicious in his behavior during the brief period he knew him. The Journal Sentinel quoted a neighbor, Jenny Czarnecki, who said the man had lived in an apartment with his girlfriend but had moved across the street when the couple broke up in recent weeks. Oak Creek Police Chief John Edwards said police expected to release more information today and that the FBI is leading the investigation because shootings are being treated as domestic terrorism, according to the AP. Indian Prime Minister Manmohan Singh, himself a Sikh, expressed sadness that the temple was a target of violence. "That this senseless act of violence should be targeted at a place of religious worship is particularly painful," he said in a statement Monday.